Who Is the Key Person on Your Medical Team Now? It is you. Prior to leaving the hospital, you were the center of a flurry of activity, surrounded by a busy health care team—physicians, surgeons, and nurses. The surgery is over now, and you’re home. It is quiet. Now, you become the most important member on your health team. Author Rosalind Benedet, R.N., understands the concerns and questions you now have as you begin this phase of your recovery. An oncology nurse, she has worked with hundreds of women who have undergone mastectomies. 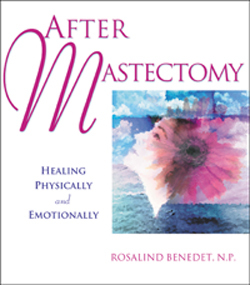 In After Mastectomy, she gently guides you through recovery, both physically and emotionally. A Guide to What Happens After Your Surgery!